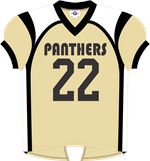 Do you want to personalize your jersey, top or cheer shell you are purchasing from ACD Sports? Most companies wouldn't dream of giving you this option for just one jersey! We are happy to offer it at this low price as a courtesy to our customers. Please allow an extra 2-3 days if you order this lettering. You may also use this section to RE-ORDER lettering if you have new players and you've already ordered your whole team from us. We will match your previous order. This is a single color screen print type lettering - NOT twill lettering or embroidery. 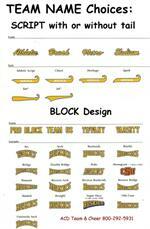 Since this option is for single jerseys, we will allow our art department to choose the font & design. Limited print colors available - white, black, red, navy, royal, gold. Feel free to include the print color you'd like in the comment section when you check out. If ordering several jerseys, you should use the Basic Lettering Package for Teams - this section is for individual jerseys/shirts/tees/sweatshirts/cheer shells, not teams.